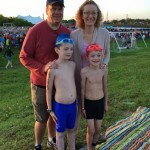 My kids, ages 8 and 9 1/2, were registered to do their third Kids-Triathlon. 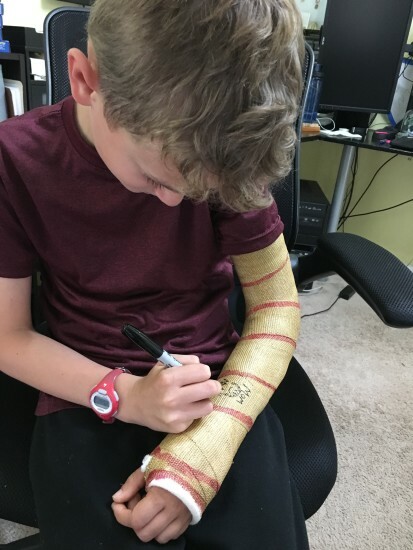 And then three weeks before the race this year, my youngest, Max, broke his arm (for the second time in 8 months–this time while playing the-floor-is-lava). 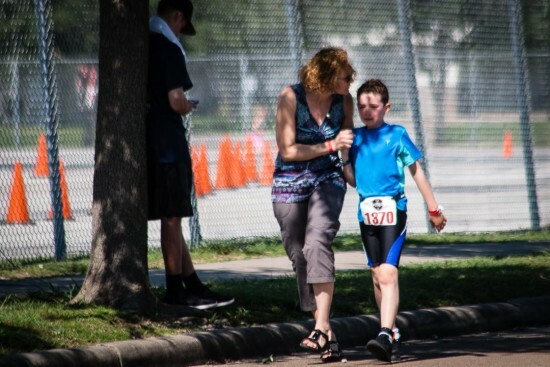 I had a choice: I could tell him to simply chin-up and deal with the consequences of his broken arm, I could join him in his devastation and call off his brother’s tri, or I could meet him with compassion and find a way to help him work through it. It was heart-breaking. But Max embraced his role, cheering his brother and their friends on. We prayed. Others prayed, and he cheered his friends on. You never would have known Max was the least bit upset. 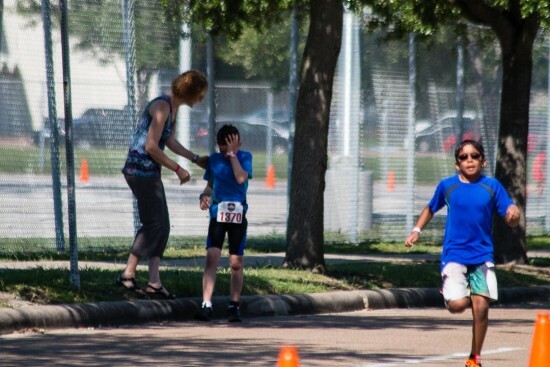 Alex, my oldest, started his race as expected: confident, nervous, excited. His 100 yard breast stroke was steady through the cold waters of the freshly drawn pool. He ran through transition with a double dimpled smile, blowing a kiss as he ran by. 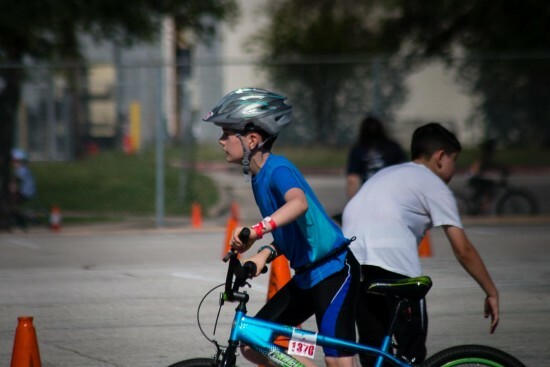 He sped out of transition on his bike with confidence. After a while I knew something was wrong; it was taking too long. Finally Max spotted him off in the distance. As Alex got closer, he was going too slow. My Mom-Spidey-Senses were going off and I ran towards him. Tears streaming, Alex wailed that his chain had been broken for the whole, entire 3 mile bike. It had fallen off three times; a volunteer helped fix it the first two, but not the third time. So he had to walk/scoot it in, incredibly frustrating and costing him buckets of time. 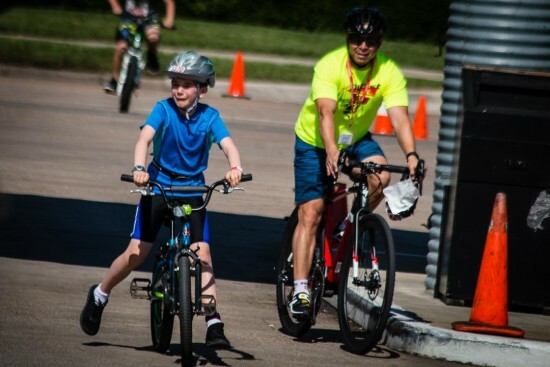 Crying, he ran his bike through the end of the course, into transition. 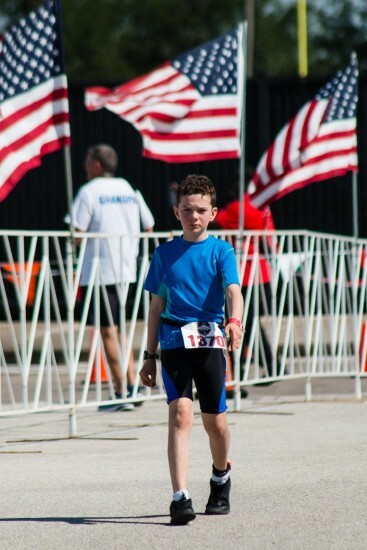 Disappointed, Alex started his run strong… but the frustration overcame him and he began to just walk, crying. Tingling Spidey-Mom-Senses, I see my son. He hasn’t given up. He’s discouraged, but he hasn’t given up. All he can see is the failure. The failure to accomplish the bike as he knew he could. He couldn’t see the tenacity. He couldn’t see the determination. He couldn’t see the strength. He could only feel the pain and disappointment, which were real… which were huge. 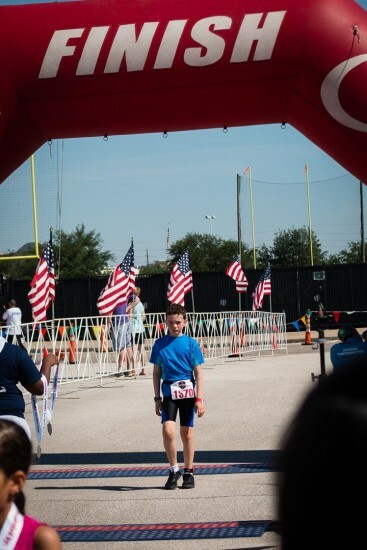 I saw my son cross the finish line against all odds. But I couldn’t cry with pride, because he was simply devastated. So I took him by the hand and walked him over to his coach. 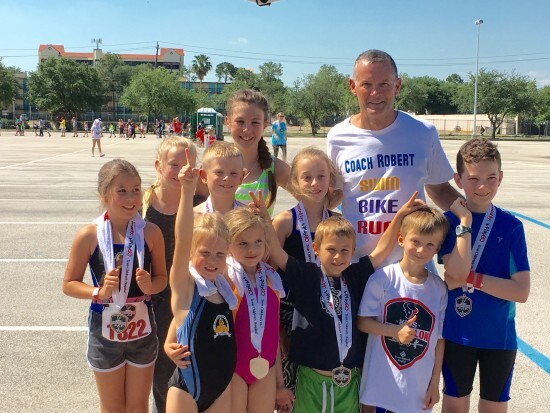 A multiple Ironman, multiple ultra-marathon (100 mile) finisher, who coached kids at the YMCA for free, just to share his love of the sport. 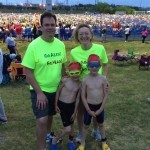 A grandfather, who loves kids as much as he loves the sport… who is one of the best examples of coaching that this professional educator has ever witnessed in her life. 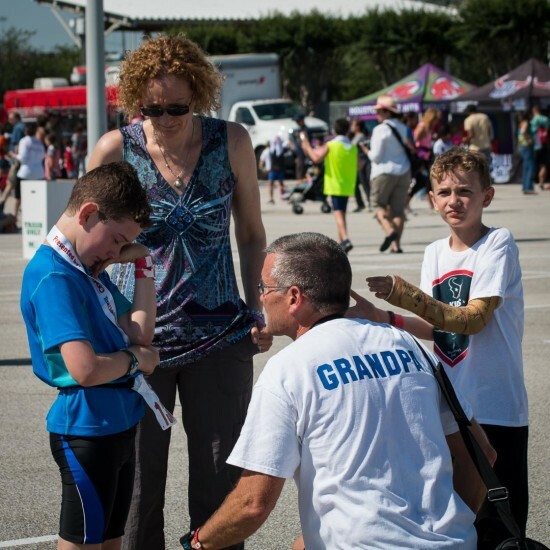 And this Ironman Coach Grandpa explains to Alex that his determination to finish–that he didn’t just give up–was one of the most inspirational things he had ever seen. Still, Alex couldn’t understand. Still, Alex couldn’t comprehend. So Coach Grandpa asked if he could take a picture and post his story on Facebook. 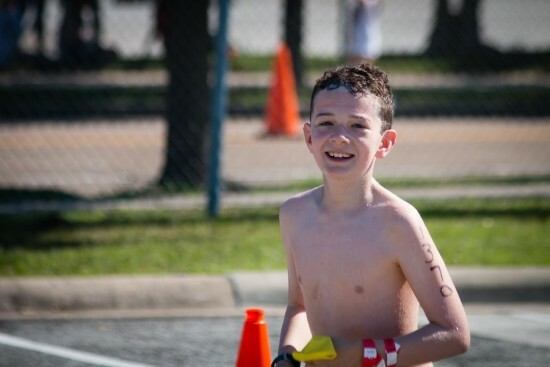 Because he was certain that there were other Triathletes that would find inspiration from this 9 year old. Why is it that we doubt the words of those who love us, but accept the words of those we don’t know? Regardless, those words were heard. The affirmations of strangers were heard. 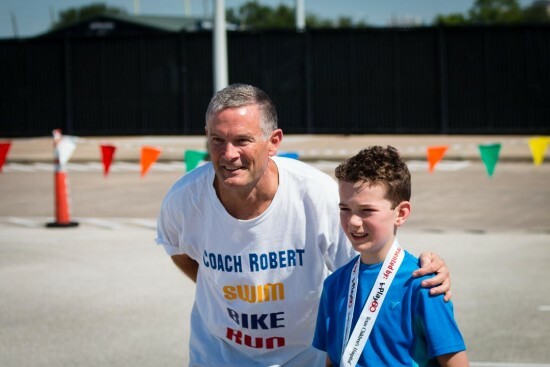 The encouragement of his Coach was heard. 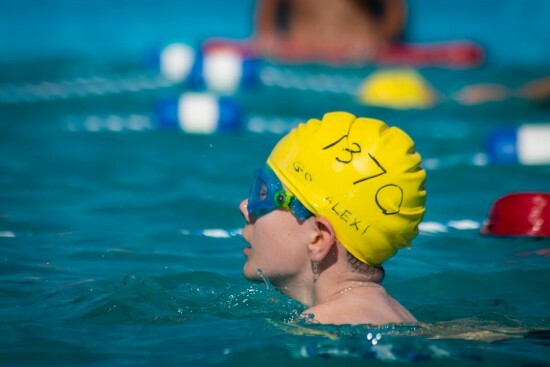 And Alex started to look at his Triathlon in a new light. Where he once saw failure, he started to see determination. Where he once saw frustration, he started to see success. And I finally let myself cry, but not for hurt, or pain, or disappointment. Rather for pride. 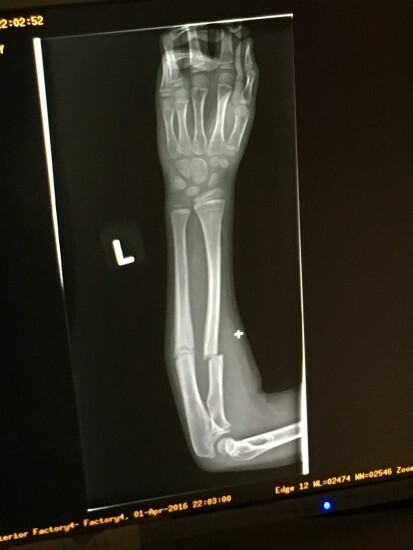 What may have been my son’s worst experience ever may have been the proudest Mom-moment of my life. Not because he won, but because he didn’t give up. He finished. And he did. He finished. There are so many lessons I take from this experience. 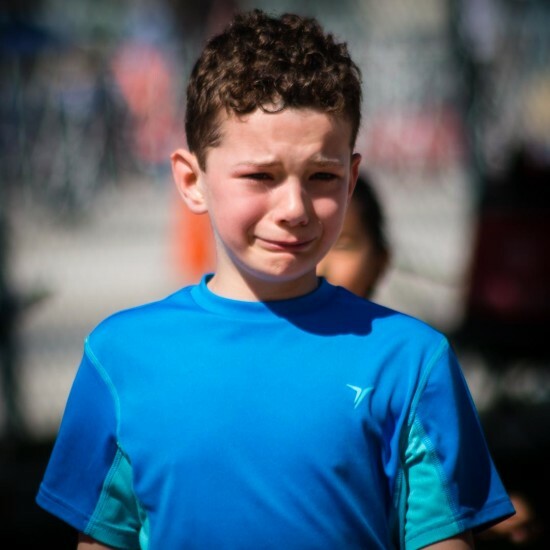 From Max who at 8 years old allowed himself to feel intense disappointment, yet didn’t let it consume him… rather, he chose to cheer on his friends. From Alex, my tenacious 9 1/2 year old, who didn’t give up. From perfect strangers who not only found inspiration from Alex’s story, but who took the time to applaud his tenacity. 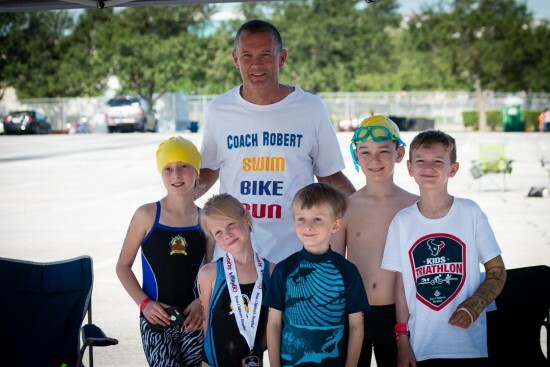 From a man who volunteers his time, talent, and treasure to help kids find success with and develop a love of his sport. From my husband who sees the moments of real, in-the-trenches-mothering, applauds them, and captures them on film. When Jesus said to love one another as I have loved you… this is what he meant. Yes, my kid did a great job at overcoming adversity, but he wouldn’t have been able to do it without you and me. When Jesus said “whatever you do to the least of my brothers and sisters, you do to me,” this is part of that. 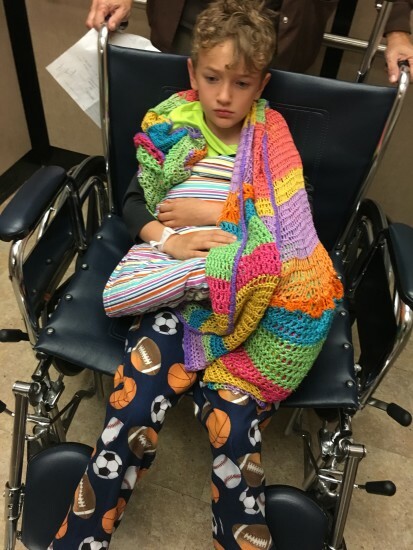 As a Mom, when I love my kid in his time of need, I’m being Christ to him. As a community, when you reach out to someone with encouragement and love, you’re being Christ to him. You are loving one another as Christ loved us. This is it. Right here, right now. And we did it. He finished. And he’s proud because of you. So thank you. 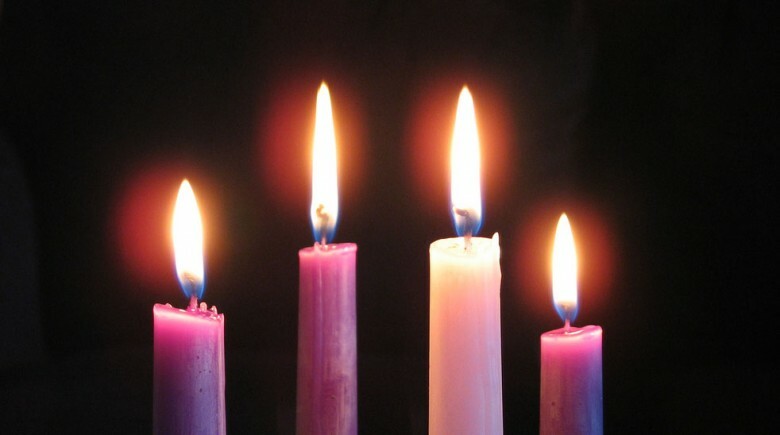 We are in the season of Advent. The season of preparation. The season of waiting. We live in an instant-gratification culture that hates waiting. We are barraged with Christmas sales, music, and merchandise in October. So when we hear talk about “Advent” we tend to think only of the countdown calendars… and even then, it’s hard to understand and embrace the waiting. But wait, we must. We encounter the waiting game in every nook and cranny of our lives. We wait in lines. We wait in traffic. We wait for news of a job, news of a diagnosis, news of a birth… a death… a pregnancy… In this season of Advent, we are given the opportunity to baptize (notice the little “b” there) or consecrate (set-aside for God) our experiences of waiting as time to be present to the moment… to the yearning for goodness. Perhaps in the waiting, we can put down the cell phones and set aside the frustration and take the opportunity to pray. In embracing the waiting, perhaps we can relinquish control to the One who is the Messiah. What is it that we are “preparing” for? We prepare for the coming of Christ. For young children, we certainly focus on the Miracle of the Incarnation: in Advent we prepare for the birth of Christ. But as we grow older, we hear the readings throughout Advent… readings that are not simply about the coming of the Christ-Child, but of the Second Coming and John the Baptist’s message of repentance. The Past: The first coming was the coming of Christ in history: the Miracle of the Incarnation. The Present: The coming of Christ within the hearts of disciples. The Future:This final coming (often referred to as “The Second Coming”) will take place at the end of the world (the Apocalypse). The Past – The Incarnation: Amid the secular holiday retail extravaganza, we do manage to see the images of the nativity, however meager. Look for them. Revisit the story of the Nativity. Marvel at the Mystery of the Incarnation: God became human. The Future – The Second Coming: Though admittedly, we don’t see many images of the Second Coming in seasonal decorations. Not very heart warming, I suppose. Even as Jesus himself admits we do not know the hour (Matthew 24:36), we are called to prepare our lives for this reality by having our priorities in order. The Present – In Our Hearts: St. Bernard referred to this dimension of Advent as the “invisible” reality. Here, we can look to the multitude of Christmas movies and focus on the messages of conversion, from The Grinch to Rudolph to even my least favorite, Frosty. Imagine going to the mailbox and sorting through the bills and junk to find you have received a very special announcement: Jesus will be joining you for dinner tomorrow night, and he’s very much looking forward to it. Somehow – however you need – you know for certain that this is not a joke. Once you get over the shock, what’s the first thing you’ll need to do? Even as I write this question and I know the “right” answer, I feel myself tempted to do an emergency house cleaning while I let my husband deal with the menu. And then there’s getting the kids cleaned up, into nice clothes and practicing their table manners. The thing is that Jesus couldn’t care less about the condition of my house. What he cares about is the condition of my heart. When John the Baptist tells us to Prepare the Way… to Repent and believe… he’s telling us to get our priorities in order. To quit obsessing about the things that don’t matter (consumerism, materialism, and perfectionism, just to name a few) and give our hearts to the things that do matter (love, presence, and a faith that does justice). What do I need to do to prepare my heart–my life–to welcome Jesus? You know how timing is everything? It turns out that our Sacrament prep conversation occurred on the evening of St. Teresa of Avila’s Feast Day. The prayer attributed to St. Teresa, “Christ Has No Body But Yours,” touches upon this theme of God relying upon us to help and love others. Making that connection between the idea of God’s love for us and our role in making that happen is important at any age. 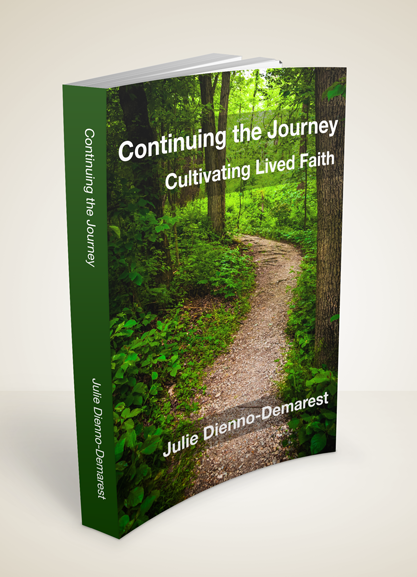 Fast forward a couple of hours, and later that night, instead of making the kids’ lunches, I sat on the floor of my office and packed up 70 copies of Continuing the Journey to ship out to 35 different parishes in the Houston area. (Yay book sales!) So I went to bed promising to do lunches in the morning, even though I know that’s never a good idea. When I awoke with a viscous head cold, I decided to sleep in a little later, drop the kids at school, and then make and deliver those lunches by 11:30. Plenty of time! Except before I went over to school, I stopped at the Post Office. Turns out it takes a lot longer to mail 35 packages than I expected. Turns out that I really should have either pre-paid or made an appointment. I take one look at Alex’s face and see the swollen, puffy red splotches around his eyes. 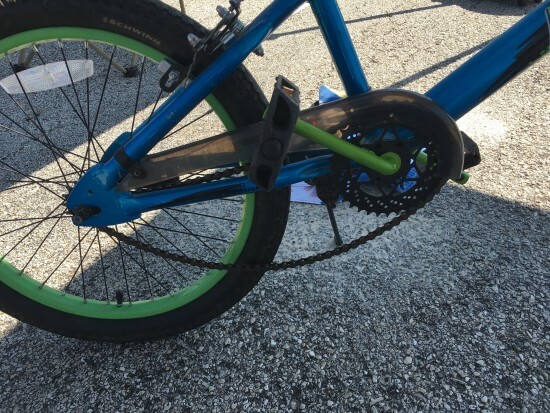 It was one of those “one-too-many-things-went-wrong” situations, but all he could focus on was this little plastic shoe lace lock thing that broke. A very sad, but relieved “Yeah…” came out. “Okay.” And he put his little hand in mine as we walked out. So as we walked out of the school building towards the car, I picked him up into a bear hug so I could give him some love. We got into the car and pulled out of the parking lot. This made him cry even more, so I pulled the car over, he climbed into the front seat, and I just gave him some more love. Alex is not the most verbally expressive kid, so I only got a few garbled pieces in a very high pitched voice, but one tidbit stood out. When he had started to get emotional at school, one of the younger children in their mixed aged class called Alex a cry-baby, and then denied doing so when confronted. Alex was most upset by the injustice of it all: Together, the students had created, agreed to, and and signed a Class Constitution that explicitly stated they are to show compassion to one another (not make fun of each other). He was too upset to talk about it any more, so I gave some love and we went about running errands, fixing shoe lace locks, and stopping by a Starbucks to pick up a kid-hot-chocolate (which is a super-small serving at a kid-friendly “warm-chocolate” temperature). 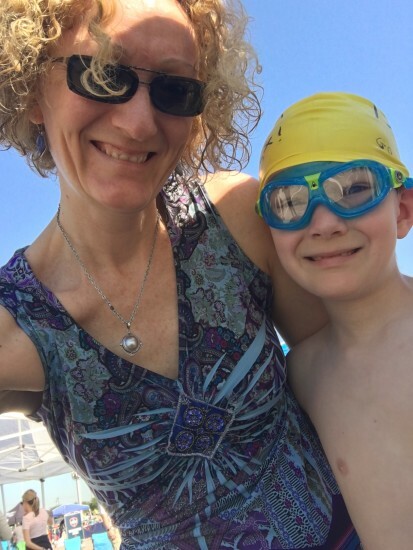 Later in the afternoon, I told him about why I was so late to drop off the lunches–it took a lot longer to mail 35 packages than I thought. But instead of the Post Office being a thorn, it turned out to be my rose. 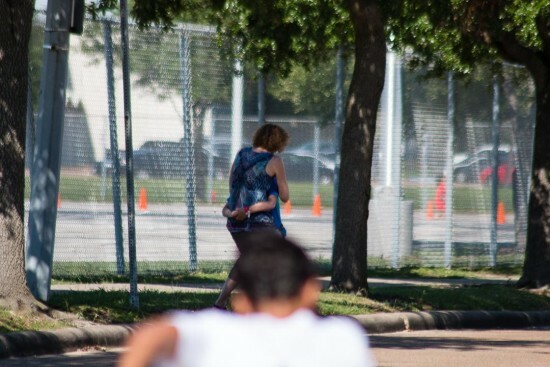 If it wasn’t for this unexpected delay, I wouldn’t have been so late in dropping off the lunches that I needed to walk into his classroom at that moment and see him. I wouldn’t have been there at exactly the right moment to give some love. “You know Alex, last night when Max and I did Sacrament prep, we talked about something that relates to this. You know that God loves us, right? Well, the way God helps us experience that love is through one another. God knew you really needed some love today, so He took advantage of my delay and put me in the right place at the right time. God sent you love through me. God gave me the opportunity to love you, and of course I said yes! You can ignore it, which kinda hurts God’s feelings. You can be mean to the person, which really hurts God’s feelings. Or you can give love, which really helps God out. And that’s the thing that’s so upsetting about [your younger classmate]. He saw that you were upset and instead of offering love or compassion, he chose to be hurtful. The reality is that this dynamic of giving and needing love presents itself to us every day. Sometimes it’s obvious: your child is visibly upset and you have a unique opportunity to respond. Sometimes it’s more subtle: a friend crosses your mind while you shower and you find yourself suddenly filled with gratitude for their presence in your life. It’s at these times–both the obvious and the subtle–that God is tugging on our hearts and asking us to help Him shower His people with love. How do we respond to this tug? By ignoring it? By lashing out against it? Or by offering love? If there was one thing you could (magically, effortlessly) change about yourself, what would it be? Sit with your answer. What does it tell you about yourself? Does it have to do with something you struggle with? How does it relate to your personal goals? Hopes? Dreams? What does it tell you about where you are on the spectrum between self-love and self-loathing? 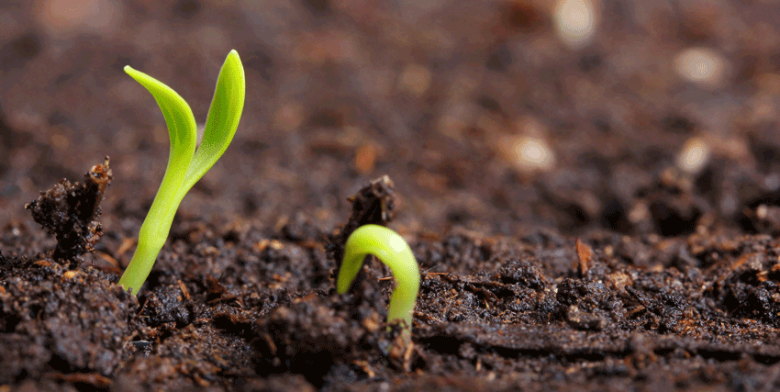 In the lifelong journey of growth and change, there is usually some thing or another that we are working on improving. This is good. However, there is a legitimate concern for our spiritual well-being insomuch as how we treat ourselves in the process. You are a child of God, created in God’s image and likeness. When it comes to the things about yourself that you want to change, do you honor the image of God within? Do you treat yourself with the love and respect that the image of God deserves? Healthy self-love appreciates the goodness that is. It is from a place of love, not hate, that we are called to conversion – or metanoia. In the reflection “Just Paint Over It,” I referenced the Greek word metanoia while discussing the transforming process of forgiveness. Metanoia [pronounced meta-noy-ah] translates as “a change of heart.” Meaning a conversion where the person turns away from what is destructive, hurtful, hateful, and instead turns towards God. Too often, however, we can be overly critical of ourselves in a way which is neither helpful nor loving. There is a fine line between goals that motivate and the expectation of nothing less than perfection that can shut a person down. There are two times that the word “perfect” appears in the gospels, both in the Gospel According to Matthew. The first is in Matthew 5:48, which is the part of the Sermon on the Mount in which Jesus discusses Love of Enemies. The second appears in Matthew 19:21 within the story of The Rich Young Man. It’s the all-or-nothing extremes that are useless. Unhelpful. Paralyzing. In no way does Jesus insinuate that this rigid interpretation of perfection is what we are to aim for. Growth—change—is a process. Metanoia is a “turning” away from something (sinful) and towards God (who is wholeness, life, and truth). Think about the self-improvement / growth things that you are working on in your life. Do you treat yourself with love in the process of turning? Or do you become overly critical and hateful about perceived failures? Because that “hateful” thing is not what Jesus would do. To move beyond my own struggle with perfectionism, I found it helpful to redefine “perfect” as functioning at my best, right now. For me that implies being my best and doing my best in the present moment, while looking to take the next step to become better. The “next step” is an important concept in overcoming paralyzing perfectionism, because it recognizes the space between the “reality of now” and the “ideal” or “goal.” And in order for it to function, the “next step” should be realistic. Small. Doable. And then celebrate the success. And build upon it. Because that is perfect. They know me through-and-through and love me all the more. Their genuine care and concern for my well-being is as warm as their hugs. I delight in their presence, savoring the moments of quality time, the great conversations, the honesty, the fun, and the laughing. The laughing is the best. Friendship has lots of categories: good-friends, old-friends, Mom-friends, family-friends, work-friends, Facebook Friends… and they’re all good. Whether it’s online or in-person, friendship is about community. It is a community with whom we have fun; it is a community who challenges us, comforts us, supports us, and cheers us on. And within this community of friends, different people have different roles. Beyond the “BFF” label (meaning “Best Friends Forever” – and yes, Mom, that was for you), there are certain people in our lives that are part of our “inner circle.” These are the close friends you appoint to a place of honor in your life. I once knew a woman who called this group her “Personal Board of Directors.” (My husband refers to it as “The Brain Trust.”) These are the folks who we tend to check in with regarding our life decisions and the ones with whom we cannot wait to share any “big” news. We may not always agree with the counsel offered by members of our Board, nor do we always follow their advice. However, we certainly listen to what they have to say – good or bad – because we value their input. Who have you appointed to your own Personal Board of Directors? The friendships filled with philia love can touch us so deeply that they may even bring the Divine Presence into our lives. In Touching the Holy, Robert Wicks identifies four different kinds of friends that it is important to have in our lives. (Though Wicks notes that it’s certainly possible for one friend to have multiple roles). The Prophet This is the friend who points out the truth. “Prophets challenge us to look at how we are living our lives” (99). Prophets prompt us to examine whether we are listening to God’s voice and following our values or if we are being swayed by “other” voices. When the prophet-friend asks, “What’s that about?” it makes us think. This is the friend who will speak the difficult truth (with love), despite discomfort or pain. Many friends have been the “prophetic voice” in my life, but Theresa and Stacey stand out as examples for me because of how and why they speak the truth. Who are the Prophetic Friends in your life? The Cheerleader We all need people in our lives who offer the cheerleader’s unabashed, enthusiastic, unconditional acceptance. This is the person who helps us see the reflection of the loving face of God more readily in ourselves and others. When we’ve had a difficult day, this is the person we turn to for loving support and encouragement because they say just the right thing to nurture our own self love. The cheerleader is the friend who offers the presence of God’s mercy and love. This is the friend “who gets joy out of seeing the footprints of God in our personality” (102). 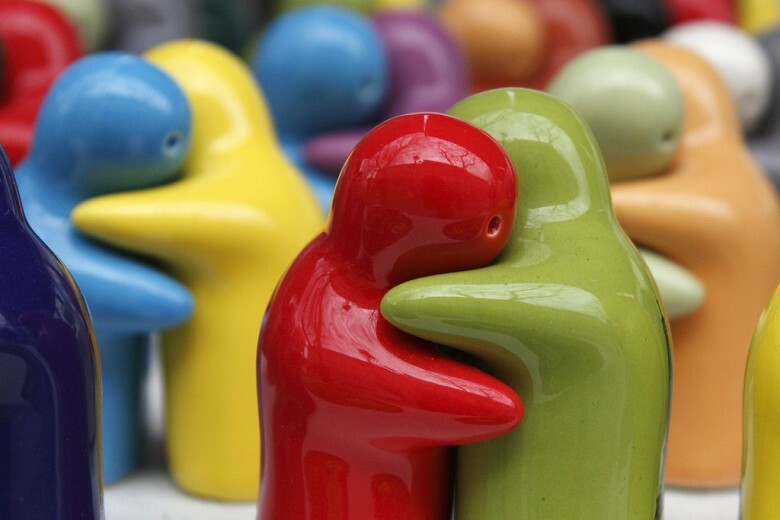 “Warm friends represent the incarnational love of God in our lives” (106). My Grandpop was perhaps the greatest cheerleader there ever was. I’m proud to say that my Mom and my sister, Laurie continue Grandpop’s legacy of enthusiasm and acceptance. I can’t wait to share news with them because they triple my own excitement. When I need affirmation, I call them. In their love and support, they remind me of God’s goodness dwelling within me. Who are the Cheerleader Friends in your own life? My husband, Peter takes the cake on this one. Probably because he enjoys mocking… Nevertheless, he helps me laugh at myself, especially when I’m being completely unreasonable or unrealistic. April stands out as another great example of a good harasser friend, especially when she’d pull out the Yiddish. Who are the Harasser Friends in your own life? The Spiritual Guide “We will never cease to need an array of spiritual guides to help us deal with our unrecognized and unnecessary fears, to help us appreciate the need for proper detachment, and to lead us to a sense of enthusiasm and perspective in a world strained by anxiety and confusion” (109). This friend helps us identify our deepest fears, soulful longings, and treasured values. This is the person who helps us process experiences in our quest to make meaning of our lives. At different times in my life, different people have served in this role. In high school, the adults and leaders in my youth group (Antioch) were my spiritual guides. In college, it was Karl. In grad school at Boston College, I found spiritual guides in Theresa, Andrea, Kyle, and Jerry. My friend Julie is a good spiritual companion. Sometimes I looked to counselors and spiritual directors to fill this role. I also turn to good books and special places to nurture and challenge me spiritually. I don’t necessarily talk with the friends whom I consider “spiritual guides” on a regular basis. But when we do talk, we speak with ease and with depth. Who are the Spiritual Guide Friends in your own life? Wicks points out that these four friends help to balance each other out. Too much cheerleader and not enough prophet might make a person a bit full of themselves… too much prophet and not enough cheerleader might make a person down on themselves… So we need all four kinds. Which is good, because I have each of these friends. Moreover, I want each of these friends in my life. I am a better me because of these friends. And I want to be this kind of friend to others. This is what I mean when I say: I love my friends. Can you relate?